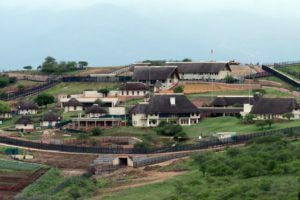 President Jacob Zuma’s infamous Nkandla homestead gained notoriety when the South African Government spent R265-million on “upgrades and security provisions” at Zuma’s home shortly after he ascended to the presidency of the African National Congress. A lengthy investigation by then Public Protector Thuli Madonsela found that Zuma should re-pay some of the money (approximately R8-million or 3% of the total) for such additions as a swimming pool, a cattle kraal and unused staff accommodation. The homestead, which has been called an African version of the Southfork ranch made famous by American TV show “Dallas”, is always referred to as being in Nkandla, but it is many kilometers away from the town of Nkandla. Sadly for the President, it does lie within the municipal boundaries of the town, which means that the leader of ANC lives in a municipality controlled by an opposition party, the Inkatha Freedom Party. Although you may be surprised at how little was built for so many millions of Rand, the complex is an impressive sight and certainly worth a “touristy” photograph.